Southerners are proud of their roots spanning back through eons. For Alan Stout, a native Southern gentleman, he’s translated his love of history into collecting and selling fossils. In Stout’s personal collection he also has multiple skulls belonging to Sabre tooth cats (though these are not for sale). Stout is most well-known for triceratops horns. He’s sold around 10 this year going for about $3,000. Another item in his collection was the tusk of a wooly mammoth, for $4,500. “It’s a perfect piece, all solid ivory,” he said. “It’s really nice. It even has the normal wooly mammoth shape.” He’s also got claws from the T-Rex, Raptor and other prehistoric predators. If you’re in the market for other collectible, check out Stout’s assortment of dino eggs, fossilized fish, and massive teeth. 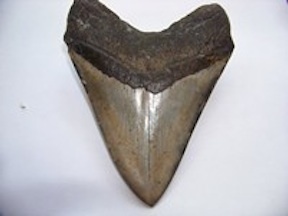 A tooth from the Megalodon shark, the largest fish in history! Stout said he can distinguish fossils from ordinary rocks because they’re typically lighter (although they’re heavier the more mineralized they are) and rocks tend to be more rounded. He obtains most of his dinosaur bones by traveling out west and buying from fossil hunters. He also had a whole Keichousaurus hui, an extinct aquatic reptile from Central Asia. Thankfully he has a friend in Washington state who imports them, so Stout didn’t have to trek across the globe. About 70 percent of Stout’s business is done abroad, with 30 percent done in the United States. Yet with all his worldly knowledge, Stout declares the South as his home and he has a deep, abiding love for the region. For more information, check out Stout’s web site. He’s happy to speak with potential buyers regarding his fantastic fossils. 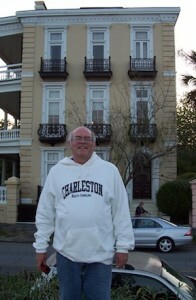 Alan Stout, the gentleman of fossils himself, on a trip to Charleston.